Researchers: Shun-Rong Zhang , Philip J. Erickson, Larisa P. Goncharenko, Anthea J. Coster, and William Rideout, MIT Haystack Observatory and Juha Vierinen University of Tromsø. Bhaskar Kundu and Dibyashakti Panda, National Institute of Technology Rourkela, India, Vineet K. Gahalaut, Ministry of Earth Sciences, New Delhi, India and J.K. Catherine, National Geophysical Research Institute, Hyderabad, India. Iurii Cherniak, University Corporation for Atmospheric Research and Irina Zakharenkova, IZMIRAN. The 21 August 2017 total solar eclipse across the United States blocked solar radiation and influenced the ionosphere and the rest of the atmosphere. The total electron content (TEC) in the ionosphere was measured with UNAVCO’s network of U.S. Global Positioning System (GPS)/ Global Navigation Satellite System (GNSS) ground-based sites and other geodetic sites across the country. A decrease in TEC of 30 to 40% was observed over the totality path and a post-eclipse increase followed; these changes were associated with downward plasma fluxes and thermospheric changes. The time-delayed drop in TEC allows for a measurement of the orbital velocity of the Moon, about one kilometer per second, consistent with other measurements. In addition, ionospheric bow waves and supersonic ionospheric perturbations were observed with high fidelity, highlighting the complex connections between multiple layers of the atmosphere. Ground-based GPS/GNSS sites are constantly measuring conditions in the ionosphere by tracking the signals of the many satellites in orbit through the atmosphere and to the ground-based antennae. Ionospheric corrections are continuously applied for accurate ground motion measurements. These corrections contain data about the ionosphere and the rest of the atmosphere. In particular, scientists can measure the TEC in the ionosphere with GNSS and understand the dynamics of this uppermost layer of the atmosphere. 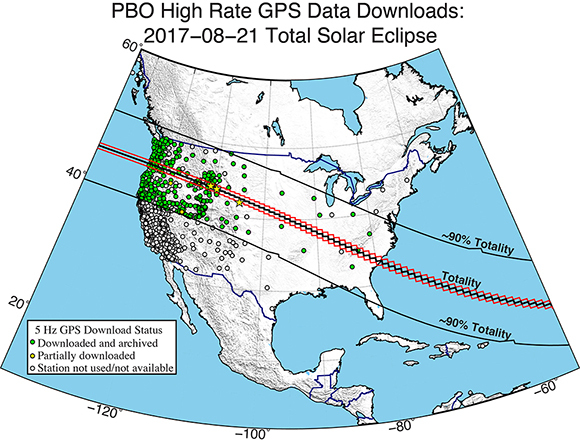 The 21 August 2017 Great American solar eclipse cast the Moon’s shadow and blocked solar radiation across the United States from Oregon to South Carolina allowing for extensive observations of the ionosphere and the rest of the atmosphere using GNSS. With about 2000-4000 ground-based GPS/GNSS sites and 40+ satellites plus the extensive totality across the continent, an unprecedented measurement of the TEC in the ionosphere exposed the atmospheric dynamics related to changing solar radiation. Zhang et al. observed ionospheric bow waves along totality mostly in the central and eastern U.S. as the eclipse passed over the country. The bow waves had a duration of about an hour, wavelengths of 300 to 400 kilometers, and phase speeds of 280 meters per second. The bow waves followed the totality. This observation provides an unprecedented large spatial coverage with high fidelity of ionospheric perturbation information to reveal a long-anticipated disturbance pattern and adds to our understanding of interactions between the Sun, Moon and Earth. The solar eclipse caused a reduction in TEC along the path of the eclipse and changes in TEC in other places and after the eclipse. Kundu et al. calculated the average migration velocity of the Moon’s shadow across the eclipse path and found it to be consistent with the relative linear orbital velocity of the Earth and the Moon. They found a decrease in TEC in the southeastern U.S. and an increase in TEC near the southern tip of South America and in Antarctica consistent with ionosphere plasma dynamic models. Cherniak et al. found the TEC decreased along the path of totality with stronger effects of 40-50% depletions over the eastern coast of the U.S. The eastern coast depletion was larger because of the lower latitude and the time of day of the totality. There was more depletion toward the equator than to the north of totality. After the eclipse the TEC increased by about 20-30%. Zhang, S.-R., Erickson, P. J., Goncharenko, L. P., Coster, A. J., Rideout, W., & Vierinen, J. (2017). Ionospheric bow waves and perturbations induced by the 21 August 2017 solar eclipse. Geophysical Research Letters doi: 10.1002/2017GL076054. Kundu et al., The 2017 August 21 American total solar eclipse through the eyes of GPS, Geophys. J. Int. (2018) 214, 651–655, doi: 10.1093/gji/ggy149. Cherniak, I., and Zakharenkova, I. (2018). 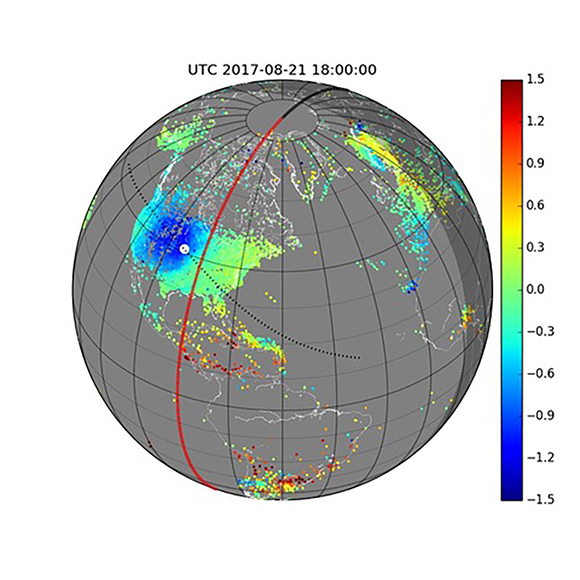 Ionospheric total electron content response to the great American solar eclipse of 21 August 2017. Geophysical Research Letters, 45, doi: 10.1002/2017GL075989.